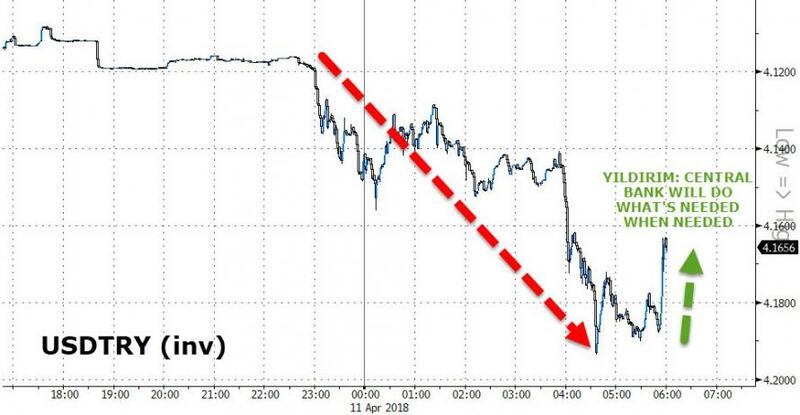 Update: It appears Turkey just reached its "whatever it takes" moment as Prime Minister Binali Yildirim warned that "speculative attacks on our economy are being made," and promised "the central bank will do what's needed, when needed" in fight against inflation. 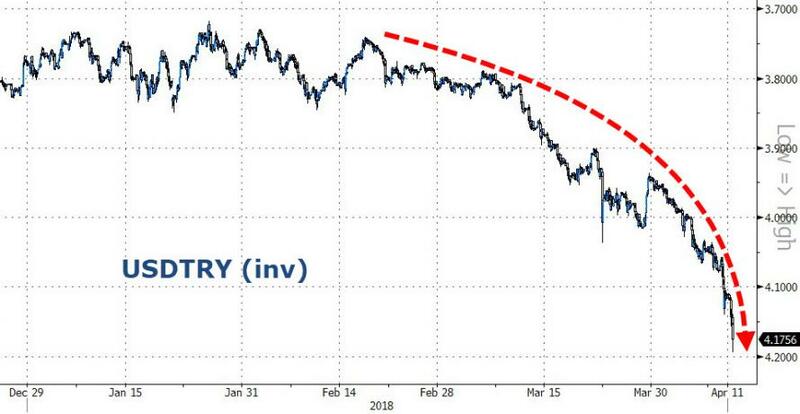 As we detailed earlier, two days ago we noted the rapid acceleration of the demise of Turkey's currency and bond markets, as Erdogan promised "to rescue investors from high rates" prompting (hyper)inflation concerns and central bank independence anxiety among investors. “it is also a well-known notion among market participants that Governor Cetinkaya may have limited room to raise rates in the current domestic environment." "Only a few weeks ago my 4.20 target for USD/TRY I’ve had for a few months looked ambitious. I was also a bit worried that I could be too bullish on EUR/TRY expecting 5.12,” he said. "We are not that far from those targets, which shows how quickly things can deteriorate." Why should the average joe American investor worry about what's going on in Turkey? As Fasanara Capital's Francisco Filia explains, the catalyst for a deep repricing in markets can be entirely endogenous, within the space of its dangerous and fragile market structure. In the last few days we added an important and overlooked exogenous factor to the list: Turkey. The Turkish lira is losing ground at pace, down over 11% this year, 42% in 2 years, 127% in 5 years. The move is mirrored by the Russian Ruble, which is nearing the weakest levels reached during the oil slump, when brent crude traded as low as 27$/bbl (it is 70$ now). US sanctions on Russian oligarchs and recent tensions in Syria are behind the recent 10% move. 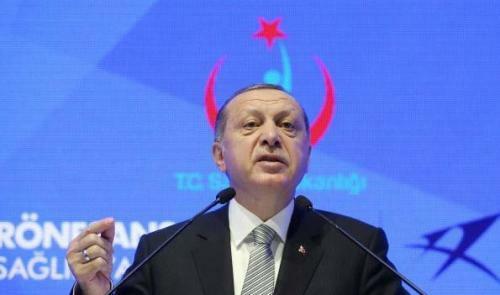 For Turkey, the narrative blames it on political uncertainty under Erdogan (challenge to constitutional rights, over 40 thousands people arrested, 800 companies confiscated in last few months, the highest unemployment in 7 years at 13%), geopolitical instability in the region, fears of trade wars escalation, etc. It matters all the most as inflation is reborn, QE is fading and rates are on the rise. When a lot of debt denominated in hard-currency meet rising rates and a fast-weakening currency, the probability of a default rises. On Saturday, Hurriyet newspaper revealed that Dogus Holding, one of Turkey’s largest conglomerates, was in talks with several banks to restructure TL23.5bn ($5.81bn) in debt. Just in September last year, Turkey was still dealing with its largest debt default, Otas, on a $4.75bn loan. Turkey defaulted (or debt restructured) 6 times in the last two centuries: 1876, 1915, 1931, 1940, 1978, 1982. Turkey was likely to be an issue to be dealt with at some point down the road: current events in FX and rates space bring such day of reckoning forward. In recent years, Russell Napier – editor of the Solid Ground - has been vocal in highlighting the dangers with Turkey debt, even without a deterioration in the political context (which is now also at play). He saw the possibility for Turkey to introduce capital controls and/or default on obligations: contagion to other EM would ensue, as “when credit stops flowing to one emerging market it stops flowing to all of them”. The latest acceleration in the Russian Ruble (10% off in two days) can provoke broader deleveraging on EM exposure, hitting on an already fragile context for the Turkish lira, and possibly proving to be the proverbial straw that breaks the camel's back. As the ruble suffers despite a strong oil price, the Turkish lira will instead feel a double hit: Turkey is a net importer of oil and therefore exposed to more damage to the economy and a worsening current account deficit in the process. What happens next in Turkey can matter to global markets, as they scramble to find a direction. Turkey is yet another catalyst in a long list of rivals (butterfly effects link) threatening to pop bubbles in bonds and equities globally (twin bubbles). Turkey could have knock-on effects on global assets in more ways than one. Directly, as Turkey represents close to 5% allocation for EM debt indexes and funds (more than that for buy-the-dip oriented vehicles). Indirectly, as it may concur in (i) breaking the glass ceiling of market complacency/narcosis, (ii) renewing fears on bank capital in Europe at a time of anti-EU political upheaval, (iii) pushing Turkey into more geopolitical assertiveness. Therefore, what may matter more than just what happens to Turkey, is what happens to risk assets globally should such a vulnerability be exposed. It would be the first one of scale in quite a while, dirtying the blue light in the sky of markets made price-insensitive to risks after 10 years of QE/NIRP helped to paper over any trouble along the way. Equity markets in the US are 9% from all-time-highs, staring down the abyss from the edge of the cliff, as they bounced off the 200-days moving average and trend-line 5 times in just two months, neatly, like a ball bounces off a floor. However, the moving average is no floor, and a long list of vulnerabilities may remind them of that. Turkey just joined such waiting list.